Synopsis: Mini Athena seems unperturbed at all by what has just happened and remains totally calm as some kind of ghost seems to be approaching her. 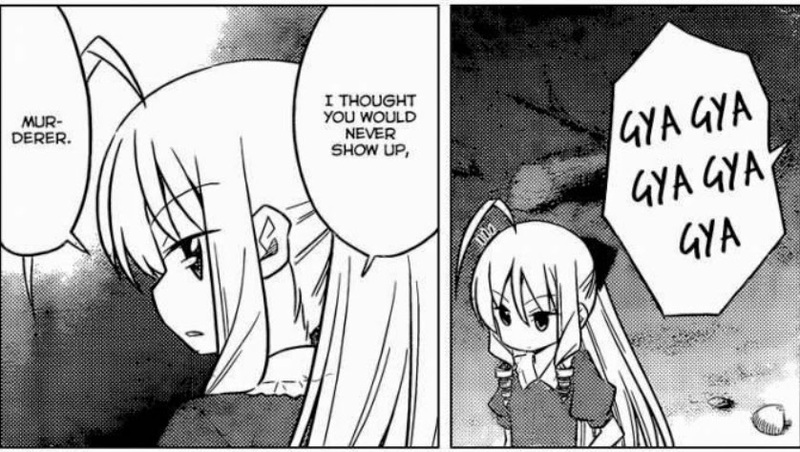 She’s also fairly certain that nothing can put Hayate and Hinagiku in any real danger. This line seems like it belongs in some h-doujin... no, really. Back to Hayate and Hina who’d just fallen into some kind of wormhole in the sand, they deduce that it must have been a trap set by the ghost of the murderer. As they’re trying to find their way out, Hayate falls into a second wormhole leaving Hina all alone. 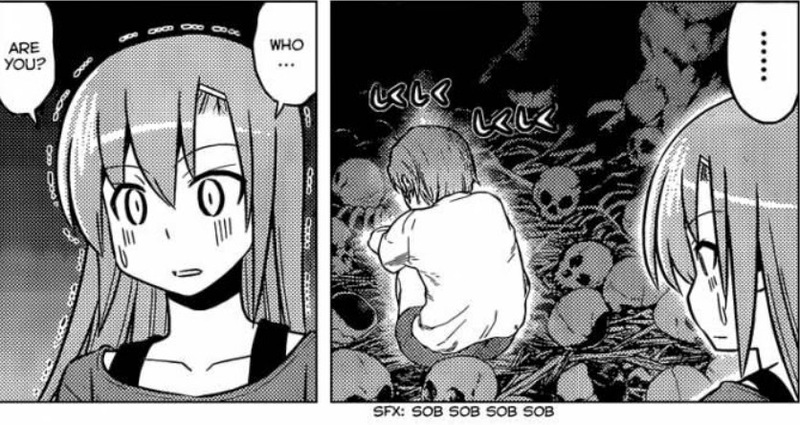 She encounters the ghost of one of the murderer’s victims and gets totally freaked out when it turns around to reveal a skull instead of a face. Suddenly, something grabs her leg from behind. She’s about to scream, but then is relieved to discover that it was Hayate who had managed to climb out of the hole. 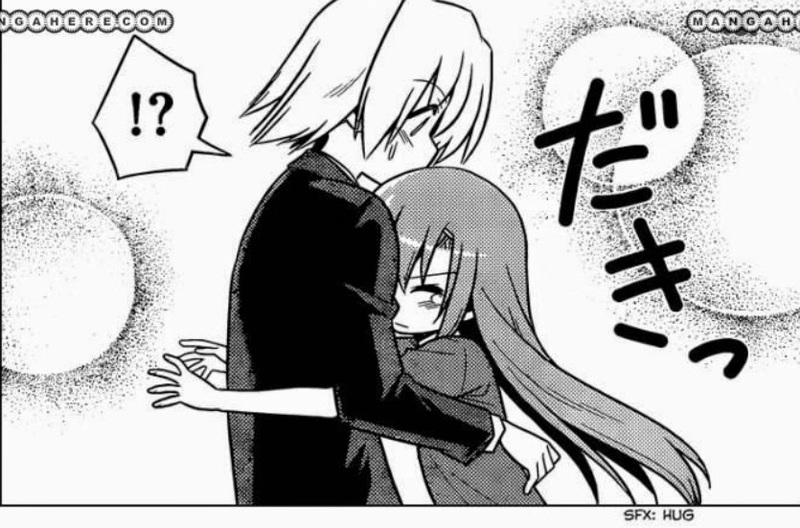 She clings onto Hayate and claims that she got so scared that she can’t walk anymore. Hayate gives her a piggyback ride and they continue searching for a way out. 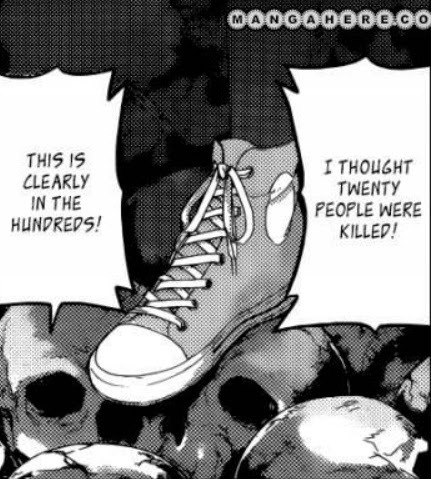 Seems Hina and Nagi have the same taste in footwear. Hayate uses this moment to tell Hina that he thinks she looked cute when she was scared. Finally, what Chiharu had told her about using this opportunity to go on the offensive clicks with her. 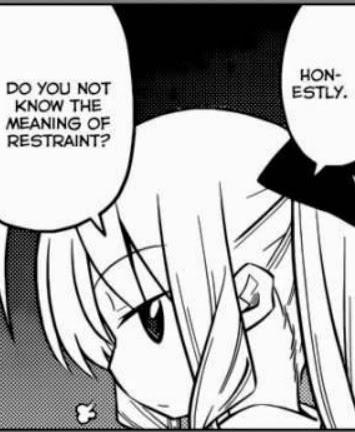 She holds on tight to Hayate and appears to be set for a confession… but, I guess we’ll find out where that goes next week. Review: Hmm… what can I say except that this felt like nothing more than a transition chapter. 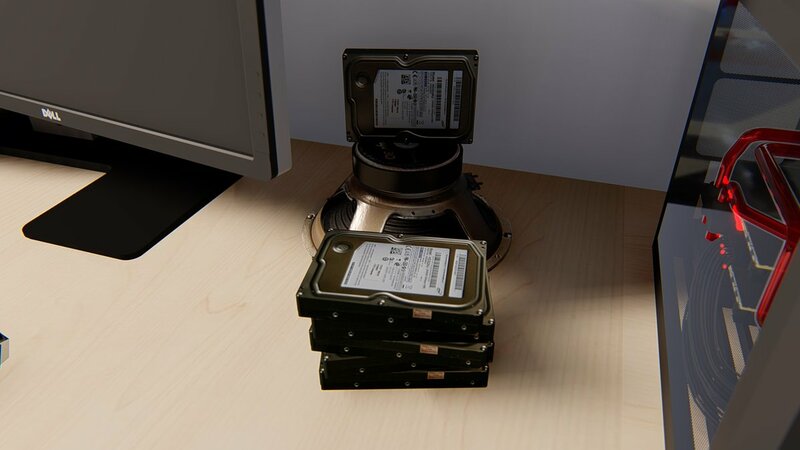 Seems like the really juicy stuff will happen next week. For the Hina fans at least, this chapter was filled with several shipteasing moments, but what all that will ultimately come down to hasn’t even been revealed yet. Also, for those still waiting for big A-tan, not quite yet this week, people. At least you get to see her on the cover eh? No speculation corner this week. Can’t think of a thing. In fact, I have very little to say about this chapter in general. Oh well, let’s just wait and see what happens. I do hope Hina manages to confess or something, it would be good for her character development and it would be super annoying if all these chapters of set-up went nowhere. 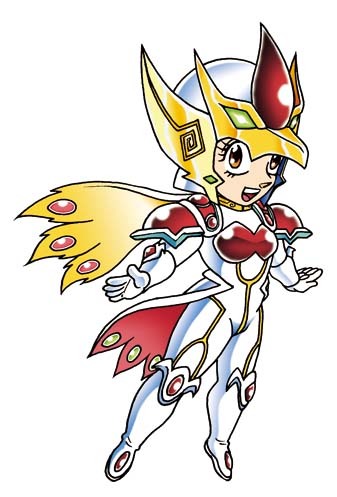 Also I'm kinda fine with big Athena not coming back yet when Alice with her memories back is basically the same thing. Minus the drama from the other girls realizing who she is, I guess. This chapter made me realize though, that the manga is way past the point where confessions feel particularly important. After Athena, and Ruka, there's very little ground left unexplored in that respect. About the only thing left is helping Hayate untangle his own feelings and I don't think we're there yet. Hata seems to have a plan going so we'll see what happens, I guess. Gotta agree with you. 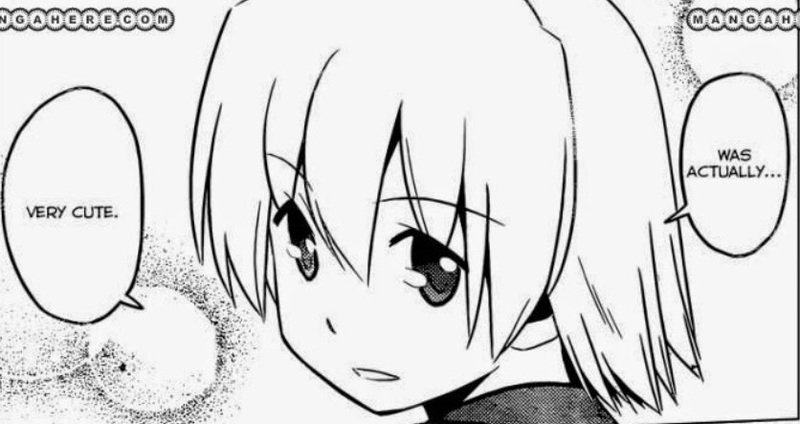 It would be a rather big surprise if Hayate suddenly decides that he's actually in love with Hina though... but even that wouldn't surprise me seeing how easily he seems to develop feelings for someone as we've seen in Ruka's case (and Hinagiku has been around him a little bit longer). As for Hina's confession, unfortunately, it looks like Mr. Murderer is set to throw a monkey wrench on this attempt -- although it would make sense in the context of the random airplane chapter. Y'know, I just realized I'm sort of contradicting myself. I meant that it would be a big surprise for everyone, but even that wouldn't surprise me. Yeah, this chapter was kinda plain for the most part. Nothing really happened except for some ship tease moments. And I doubt we're going to be seeing much of the other characters for a while unfortunately. Yup. Well, the Mr. Murderer side story seems kinda interesting, at least.